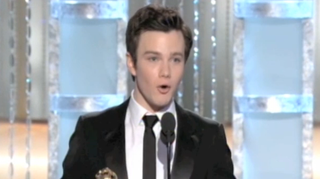 Let's start with the simple—but powerful—speech from Chris Coolfer, who took home a best supporting actor award for his role on Glee and, in the process, made a lot of folks teary. And then there's Aaron Sorkin, who seemed to be giving a subtle (or not-so-subtle) response to criticism of the way he wrote (or, well, didn't write) the female characters in The Social Network. Okay, so technically Sorkin's not addressing specific issues. It's kind of a non-response that still seems pretty...response-y. And it's certainly interesting that he took the opportunity to get all rah-rah for the ladies. So we'll take it. But was it satisfactory? The stars have been seated, the booze is flowing, Ricky Gervais is ready. Let&apos;s begin!